The results of U.S. News & World Report’s hotly anticipated “Best Hotels of 2018” awards list are in, and Auberge du Soleil has been named No. 1 Napa Valley Hotel. “We are honored to be acknowledged by U.S. News & World Report as the No.1 hotel in Napa Valley, as this distinction celebrates the heritage and soul of the Auberge du Soleil experience,” said George Goeggel, Managing Partner, at Auberge du Soleil. The results of U.S. News & World Report’s hotly anticipated “Best Hotels of 2018” awards list are in, and Auberge du Soleil has been named No. 1 Napa Valley Hotel. The resort that embodies the sophistication of the South of France infused with California soul, has also been named No. 3 Best California Hotel and No. 16 Best Hotel in the USA. 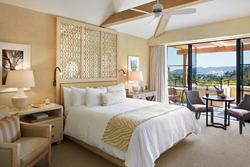 Napa Valley’s quintessential adult getaway, Auberge du Soleil features wine country’s most luxurious accommodations, spectacular valley views, a 12-time Michelin Star award-winning Restaurant and an exclusive spa. The property’s exceptional attention to detail and unabashed romance earn Auberge du Soleil its renowned acclaim. Special touches include custom sculpted soaking tubs and al fresco showers on private terraces, intimate walking trails that invite guests to linger among the olive groves and curated sculpture garden, and the spa’s hammam steam rooms and temperate soaking pools. Auberge du Soleil is the Napa Valley's longest-standing Forbes Five Star hotel and a member of the prestigious Relais & Châteaux. The hotel consistently receives the highest accolades from the hospitality industry, discerning guests and the media, and is perennially ranked among the best in the world by influential publications. The annual awards program from U.S. News & World Report, nationally acclaimed publisher of consumer news and information, evaluates more than 3,000 luxury properties across the United States, Canada and Mexico. The methodology accounts for both expert and guest sentiment and industry accolades a hotel receives to determine each hotel's rank. To view the full list of 2018 rankings, please visit https://travel.usnews.com/Hotels/USA/. Auberge Resorts Collection owns and operates a portfolio of exceptional hotels, resorts, residences, and private clubs. While Auberge nurtures the individuality of each property, all share a crafted approach to luxury that is expressed through captivating design, exceptional cuisine and spas, and gracious yet unobtrusive service. Properties in the Auberge Resorts Collection include: Auberge du Soleil, Calistoga Ranch and Solage, Napa Valley; Esperanza and Chileno Bay, Los Cabos, Mexico; Hotel Jerome, Aspen; Malliouhana, Anguilla; Nanuku, Fiji; Hotel Madeline and Element 52, Telluride, Colorado. ; Hacienda AltaGracia, Costa Rica; Mukul, Guacalito, Nicaragua; and Auberge Beach Residences and Spa Fort Lauderdale (opening Spring 2018), Bishop’s Lodge (opening Autumn 2018), Lodge at Blue Sky, Utah (opening Winter 2018-2019) and Commodore Perry Estate, Austin (opening 2019), with several others in development. For more information about Auberge Resorts Collection, please visit http://www.aubergeresorts.com/. Follow Auberge Resorts Collection on Facebook at facebook.com/AubergeResorts and on Twitter and Instagram at @AubergeResorts. The Friedkin Group is comprised of a consortium of automotive, hospitality, entertainment, golf and adventure companies. These organizations include: Gulf States Toyota, GSFSGroup, GSM Marketing, US AutoLogistics, Ascent Automotive Group, Auberge Resorts Collection, Imperative Entertainment, 30WEST, Diamond Creek Golf Club, Congaree and Legendary Adventures. The Friedkin Group is led by Chairman and CEO Dan Friedkin. For more information, visit http://www.friedkin.com.